Some say that many of the negative effects of dieting, like a decrease in your energy levels, a dip in your metabolic rate, and a stomach that feels emptier than a hermits address book, are caused by low leptin levels. That’s why cheat meals, cheat days, and refeeds – all of which give your leptin levels a boost – are so important. Hormones will be restored, metabolisms will be boosted, weight loss plateaus will be shattered, and all will be well with the world. Or at least, that’s what’s supposed to happen. Taking a break from your diet, be it in the form of a cheat meal, a cheat day or a refeed lasting a couple of days, does have its benefits. However, the reason that it does work probably doesn’t have much to do with leptin or your metabolism. More on that in a moment. First, what is leptin? What does it do? And how do diet breaks affect it? Named after leptos, the Greek term for “thin,” leptin is a hormone released by your fat cells. The amount of leptin in your blood is linked to the amount of fat stored in your body. The fatter you are, the higher your leptin levels. When you lose fat, leptin levels drop. When you gain fat, they go back up again. Before the discovery of leptin, body fat was seen as a lifeless source of energy. However, work by researchers at the Rockefeller University in the 1990’s led to a radical change in perspective. 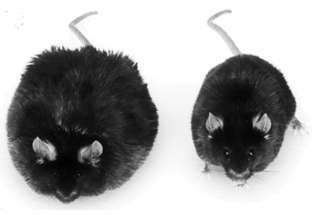 Both of the mice in the picture below have a genetic defect that predisposes them to gain weight. When they were injected with leptin — the hormone this “broken” gene normally produces — the mice lost weight. After four and a half weeks of daily injections, the mouse on the left, which did not receive leptin, weighed approximately 67 grams. The mouse on the right, who received daily injections of leptin, weighed 35 grams. As well as being affected by body fat, leptin also falls under the influence of your diet. Restricting calorie intake for just seven days has been shown to cut leptin levels in half . That’s despite the fact that body fat dropped by less than one percent. The researchers also found that the desire to eat doubled in response to the diet. And the volunteers reporting the greatest increase in hunger were those with the largest drop in leptin. In other words, subjects who experienced the greatest increase in hunger were the ones with the biggest drop in circulating leptin. In fact, leptin appears to respond to any form of calorie deficit. And it doesn’t seem to matter too much whether that deficit is created by diet or exercise [2, 3]. The bigger the deficit, the bigger the drop in leptin. Comparing the effects of two different exercise sessions, researchers from Wake Forest University found that a bout of exercise burning approximately 900 calories led to a greater drop in leptin than a workout that burned only 200 calories . Alcohol has also been shown to inhibit the secretion of leptin , which helps to explain why alcohol increases your appetite and subsequent calorie intake over 24 hours when consumed as an apéritif . In short, leptin signals the brain about how much fat is stored in your body (more fat means higher leptin levels) and how much you’re eating (if you burn more calories than you consume, leptin levels will drop). Although some have referred to leptin as an “anti-obesity” hormone, it’s probably more accurate to label it as an “anti-starvation” hormone that tells your body what to do when energy is in short supply. Can I Take Leptin to Lose Weight? Unfortunately, you can’t just take a leptin pill and hope that your weight problems will be solved forever. For one thing, leptin can’t be taken orally because your stomach will break it down. For leptin to be effective, you need to inject it. This is not only very inconvenient but also very expensive. Some studies show that using injections to raise leptin helps to decrease hunger during dieting  and accelerate weight loss . Other trials show that leptin injections have no benefit compared to a placebo [9, 10]. Although it might seem counterintuitive, many obese individuals actually have high levels of leptin. Which, on the face of it, appears to blow all of the theories regarding leptin and weight loss out of the water. After all, if obese people have high levels of leptin, why are they obese in the first place? Part of the problem is caused by a phenomenon called leptin resistance. This appears to be due to decreased leptin transport into the brain or some kind of defect in the way leptin receptors respond to the hormone . In other words, some people don’t respond to leptin in the way they should. It appears that leptin isn’t active in the part of the brain that controls eating behavior. When leptin is constantly elevated, which it will be in most overweight or obese people, the transporters that help leptin to cross from the blood into the brain become saturated. There may also be genetic causes that contribute to leptin resistance. If someone is resistant to leptin, raising leptin levels above the normal physiological range isn’t going to help much. What’s more, the physiological response to leptin is asymmetrical . That is, a decrease in leptin has a much bigger impact than an increase. Giving leptin to someone at their usual weight, whether they’re lean or obese, won’t automatically lead to weight being lost. “The primary functional role of leptin is apparently to defend — not reduce — body fat by increasing food seeking and decreasing energy expenditure when fat stores are insufficient,” writes Dr. Michael Rosenbaum in the Journal of Clinical Investigation . Where leptin may help is by normalizing energy expenditure and food intake in people who have lost weight, where leptin has fallen below normal levels. In other words, leptin “repletion” seems far more useful for people who are trying to keep the weight off, where it’s been shown to reverse many of the physiological and behavioral responses to weight loss . The idea behind periodically eating more carbs is that you increase your leptin levels, which in turn speeds up your metabolism and makes you feel less hungry. It’s true that leptin is linked to changes in blood sugar. That is, when the amount of sugar in your blood goes up, so does leptin . That’s why overfeeding with carbohydrate will raise leptin levels, while overfeeding with fat has no significant effect [16, 17]. Leptin is particularly sensitive to carbohydrate-rich foods, especially those with a high glycemic index, which tend to produce the greatest rise in leptin . However, not all carbohydrates have the same effect. Drinks sweetened with high fructose corn syrup (a blend of fructose and glucose), for example, don’t elevate 24-hour leptin concentrations to the same degree as drinks sweetened with glucose . So, we know that overfeeding with carbohydrate raises leptin levels. We also know that giving people leptin injections can reverse some of the metabolic adaptations associated with dieting. That’s where the “eat carbs to raise leptin and boost your metabolism” idea comes from. You go on a diet, leptin levels drop, you get hungry and your metabolic rate slows. If a fall in leptin is causing the problems, the argument goes, raising leptin by periodically eating more carbs should solve them. However, while it sounds good in theory, there isn’t a great deal of evidence to show that it actually works. Leptin levels may rise when you increase your carbohydrate intake. But they’re going to fall again when you return to your normal diet. It takes time for your body to respond to the increase in leptin. While a single high-carbohydrate meal may raise leptin levels, they’re not going to stay elevated long enough to reverse the negative effects of dieting. Even with longer refeeds lasting a couple of days, there’s no compelling evidence to suggest that the effects will last long enough to have any kind of meaningful impact on your metabolic rate. Don’t forget, bumping up your carb intake means taking in additional calories. In one study, overfeeding with carbohydrate for three days raised leptin levels by around 30% . Daily energy expenditure rose by roughly 140 calories. But the increase in energy expenditure wasn’t sufficient to offset the 700 extra calories required to generate it in the first place. Taking regular diet breaks has been shown, in some studies at least, to accelerate weight loss compared to continuous dieting. In the MATADOR study, for example, two weeks of dieting followed by a two-week diet break led to more fat being lost than 16 weeks of continuous dieting . The researchers took two groups of obese men, and put them on a diet for 16 weeks. The first group dieted for 16 straight weeks, cutting calories by 30-35% below what they needed to maintain their weight. The second group did exactly the same thing, but took a two-week break from their diet every couple of weeks. In other words, dieters in the second group only restricted their calorie intake for two weeks out of every four. They switched between two weeks of reduced calorie eating and two weeks of eating enough food to keep them from gaining or losing weight. The group taking regular diet breaks ended up losing 50 percent more weight than the continuous dieters. That’s a big difference. Six months after the end of the dieting phase, both groups gained back some of the fat they’d lost. In fact, the continuous dieters ended up almost right back at square one, while the intermittent dieters did a much better job of maintaining their weight loss. So why did the diet break group lose more fat? When you lose weight, your body is smaller. And a smaller body requires fewer calories to maintain it. There’s also a drop in energy expenditure that’s not accounted for by changes in weight and body composition. Based on the amount of weight someone loses, you might expect to see their resting metabolic rate drop by 10%. But when it’s actually measured, the drop turns out to be closer to 15%. The difference between the predicted drop in metabolic rate and the actual metabolic rate is known as adaptive thermogenesis. The researchers think that the extra fat loss seen in the diet break group was down to a reduction in adaptive thermogenesis. That is, taking regular diet breaks helped to “protect” the metabolism, which in turn made it easier to lose fat. However, we can’t say for sure that the extra fat loss in the diet break group had anything to do with changes in metabolism. In fact, the difference in resting metabolic rate between the two groups of dieters wasn’t sufficient to explain the superior rate of fat loss seen with intermittent calorie restriction. Instead, an increase in dietary compliance may have had a lot more to do with it. Dieting for 16 weeks straight is hard work. Knowing there’s going to be a regular break from the physical and psychological grind of continuous dieting does make it a lot easier to stick to your diet in the long run. In short, diet breaks and refeeds do have their place. For one, they give you something to look forward to. Knowing that you don’t have to wait too long before you get to enjoy some of the foods you’ve been missing out on does make sticking to your diet a whole lot easier. Bumping up your carb intake from time to time can also help you sleep, give you more energy in the gym, as well as improve your mood. However, the effect that refeeds have on your metabolism and hormone levels isn’t as great as was once believed. Any benefits associated with diet breaks probably have more to do with improved dietary compliance than with changes to leptin levels and your metabolic rate.